This animal rescue organizations web site is organized around the presentation of dogs and cats available for adoption. On the home page, visitors can view a slideshow of available animals, check out highlighted feature pets, scan for upcoming events, and see the newest animals posted. When viewing the animals available, potential adopters can page through the list or elect to search on a number of different parameters. If they are interested in one, clicking on the animal in the listing will bring up detailed information and additional, larger pictures - in an embedded window, so they don't lose their place in the list. Then, if desired, they can pull up the adoption application for the selected animal and enter their data, then submit it to CARE for consideration. If they submit multiple applications, the entered data is saved and initialized for each subsequent one. Applications are emailed to the appropriate foster home, as well as a backup person, and they are also stored in archives on the site for later reference and statistical purposes. The site also has galleries of adopted animals, FAQs, Happy Ending stories, memorial dedications, events, and a categorized library of helpful animal websites and articles. There is a simple online store for donations and tickets to events. A comprehensive administrative facility allows admins to post animals, flag animals as adopted, add stories, add events, and much more, including management of private documents. Timed jobs regularly update available animals to several national sites, such as Petfinder. The site is commpletely responsive, changing to accommodate the user's device dimensions. A pulldown menu gives users one click access to most of the site's features. Pulldown menus for easy navigation. Feature CARE and shelter animals for adoption. Newest animals posted for adoption. Searchable list of adoptable animals - dogs and cats available for adoption from CARE and shelter. Parameters include: breed, name, size, age, date, etc. Happy Ending stories, with pictures. Donation dedications, categorized and including pictures and user-selected backdrops. Searchable, categorized questions and answers. Searchable, categorized library of animal-related sites and articles. Online store, using Paypal, for donations and event tickets. Detailed list of adoption locations. Searchable list of adoptable dogs and cats. Embedded window for pulling up details of animals in listings, including more and larger images. 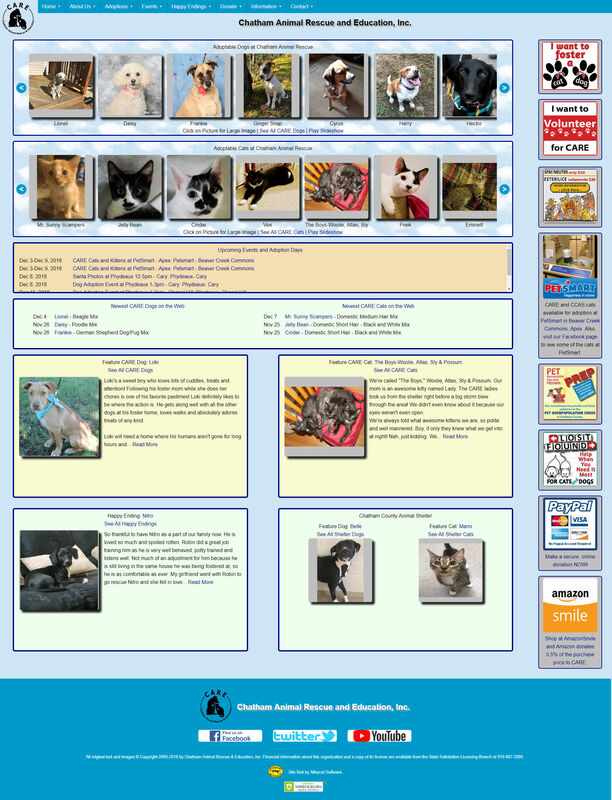 Slideshow on homepage, showing current animals for adoption. Animals from CARE fosters, the Chatham County shelter, and even courtesy listings. Fosters can post animals, and uploaded pictures are automatically resized as needed. Admins can add events, Happy Ending stories, Q&A, dedications, and favorite sites/links. Admins can add/remove items from the homepage sidebar. Admins can select feature Happy Ending story and feature adoptable animals. Posted adoption applications can be reviewed by month/year, and also summarized. Animals can be flagged as adopted, or 'unadopted' as needed. Contact emails can be configured for fosters. Trigger exports of available animals to Petfinder and other sites. Embedded windows allow user to maintain their place in the lists while viewing details. Site is listed as first or second in many general Google searches. Try 'animal rescue nc'. Full, secure access to all pages with SSL. Hand-coded pages for performance, maintenance, and uniqueness. Responsive pages adjust to users' screens.